The fifth issue of Šum Journal comes with two translations: a contamination of the local culture-sphere with ‘Meltdown’ of Nick Land (translation: Marko Bauer) and the text of Hamid de Oliveira ‘The Pied Piper of Hamelin’ translated by Andrej Tomažin. Furthermore, a manifesto against vaporwave ‘Antivejvporvejv Manifejsto’ as written by Hydrogen Element Remainder and a text by Nejc Slukan, who tries to locate (non)human rhythms in repetitive electronic music. 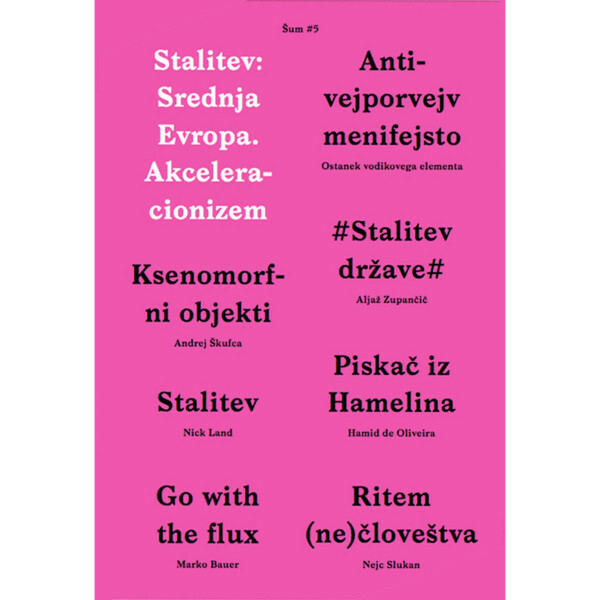 Aljaž Zupančič writes about the meltdown of the state in the context of immanent cybernetics, Andrej Škufca about xenomorphic objects, and Marko Bauer in dialog with the project ‘Acta non Verba’ (Kladnik & Neon) about accelerationism, design and art.